Food and beverage hotel teams rarely sit still. They are back-of-house, in the kitchen, or on the service floor with guests. And like most line-level team members, these individuals often need important and timely information to satisfy customers and do their jobs successfully. Bringing value to owners and general managers (GMs) in hotels worldwide. Information accessible to hotel GMs only in printed formats or through static PDFs is now available for managers and their teams on a dynamic, mobile-friendly platform. By not printing this information, each hotel location saves approximately $400 per edition – delivering a potential savings for combined Hilton franchises of approximately $2 million globally. 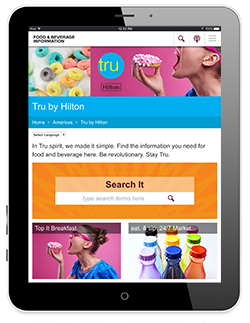 The mobile app is currently available for Hampton by Hilton, Tru by Hilton, and Homewood Suites by Hilton with other brands coming online in Q4 2017. F&B(i) was previewed by Hampton hotels and 83% of GMs said that their team members were positive about the new mobile app; 82% responded that they thought the app would help them personally be more productive. The F&B(i) app is available from Google Play, Apple App Store, or Amazon AppStore. The app is free. Additionally, the information can be viewed via desktop at fnbibyhilton.com. Users must have their property’s hotel code to login and view the content.